The Golden Dragon gets a menu update, with golden lotuses and hot peanut butter soups stealing the show. Whatever happened to sharka��s fin soup?a�? I ask aloud, as I dip my ceramic spoon into the clear stock with pale button mushrooms and green floaty mint leaves. a�?May I present you with a filament of sharka��s fin?a�? a good Chinese host was supposed to ask a revered guest, spearing it with his own chopstick. The white filaments were supposed to contain a�?qia�? or energy that enhanced the beauty of a womana��s skin and the vitality of her companion. a�?No decent person talks of sharka��s fin,a�? my companion of the evening rebukes me. a�?Ita��s on the endangered species list.a�? He belongs to the seaweed and kale brigade. a�?You like steamed fish in banana leaf?a�? 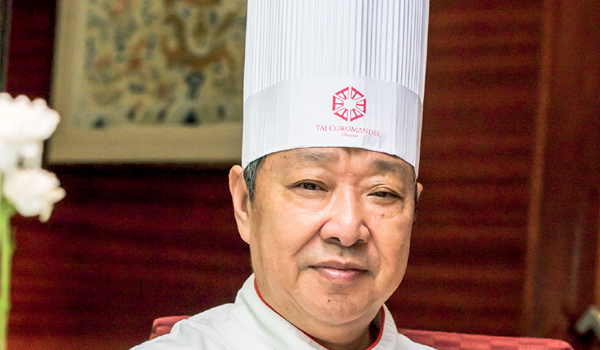 asks chef William, the down-to-earth Hong Kong-born chef who has been practising his skills at the Golden Dragon since 2010. The seaweed champion is looking happier, if a little greener. He sends a tongue tickler of two tiny asparagus spears and pale slices of pear in vinegar on a graffiti of black sauce scribbled on a white disc. Each of the starters that follow, accompanied by side dishes of sliced radish and pickled cucumber, appear like images on a Chinese scroll. The a�?scrollsa�� are made of slates of black graphite. The chicken dumpling is a golden sphere in a crisp shell of taro skin. It is paired with a transparent silken dimsum potli with shredded spinach inside, while the carrot and radish roll is a succulent morsel wrapped in Chinese puff pastry. Enoki mushrooms fried crisp spring out of a golden lotus flower cup, edible of course. He has created his own version of sauces. There is the Lao Han Ma and the Mala sauce along with the fiery orange-red of the chilli-infused sesame oil that he uses to create small Chinese-like characters on the side of the plate. The steamed fish is dragona��s tongue hot basted with pepper and ginger. After the starters, the main course is more conventional. We whiz through the spicy vegetable fried rice and noodles, a delicious bean curd with the green beans of the soya family, as we cana��t wait for the desserts. a�?From the streets of Hong Kong, hot peanut butter soup,a�? exclaims chef William. Ita��s a bowl of melted warmth, rich and sweet as a Chinese emperora��s silken sash. They did invent silk didna��t they, so why not this silken peanut soup? Ita��s gorgeous.